Before entering into a discussion of the economic features of the mining industry, it will be well to be sure that we understand, definitely, what is meant by mining. As one investigates the question, he is bound to run across varying shades of meaning for the words Mine and Mining, and so we must pause long enough to define these words according to the best usages. A search through works on mining written at various periods reveals differing ideas that have prevailed among authors. Less than a hundred years ago, it was said that a mine "consists of subterranean workings from which valuable minerals are extracted." One early writer said that a mine is one only when the operations are conducted in the absence of daylight. As time has created new fields for the industry, we find that ideas concerning the meaning of the word mine have necessarily altered, until now (according to The Coal and Metal Miners' Pocketbook), we may think of a mine as "any excavation made for the extraction of minerals." Under this definition, we properly think of the rather unusual operations of marketing coal right from the surface of the earth, in eastern Kansas, as mining. There is, in this case, no covering of earth above the workmen; neither are the operations necessarily carried on at night to avoid the illumination of the sun. So, also, placers are now correctly spoken of as mines, although but a few years ago there was drawn a strict line, eliminating such worked deposits from the category of mines. One may still run across a few men who are sticklers upon the point that a placer is not a mine. Throughout the world, at the present time, there are many places where immense deposits of valuable minerals are being excavated from open pits by out-of-doors methods, and our common term for these places is mines. Thus, in Minnesota, in that wonderful Lake Superior country, that is famous as the world's greatest known producer of iron ore, tremendous tonnages are handled every year by the modern steam shovel, which works in natural light by day and by electric lamps at night. In Utah and Nevada we find similar operations conducted in the excavation of copper ores. In Australia, the famous Mount Morgan mine is using open air methods in the mining of precious metal ore. But what about quarries from which are taken building stone, salt, kaolin or clay? Are not such substances of the mineral kingdom? Here we run across a hitch in the definition quoted above; for while we hear of "salt mines" (not "salted mines"), our parlance has not, as yet, warranted this term except for such excavations of salt as are carried on in subterranean deposits; and it is quite out of place to speak of stone or clay mines. Evidently we must pass through another transition in our conceptions about mines, or we must permit quarries and pits to be included within our realm of mines. At the present time, the prevailing practice of the men best qualified in such matters is to designate as mines those workings from which only coal, metallic ores, or gems are extracted. Hence, we should not speak of a slate, sulphur, mica, clay or phosphate mine. And yet, with all the above restriction in our nomenclature, we have not reached one very important consideration, one which we have been approaching for a number of years and which, of late, has been met and forcibly applied by the best men in the profession of mining engineering. An excavation that will produce coal, metals or gems is not necessarily a mine. The simple fact that a man can get some gold-bearing dirt from a hole in the ground does not mean that he has a mine. The occasional finding of a diamond on the sidewalks of a great city does not give anybody the impression that city sidewalks are diamond mines. There are many places in which small amounts of combustible coal can be scratched from its natural depository, but no company appears to think highly enough of these seams to install machinery and to carry on operations. In the eastern part of Kentucky there are well-defined deposits of lead-bearing baryta, though, up to date, their development has not proved successful. In Brazil there are known to be very rich areas of placer ground, and still the deposits are not worked. A friend of the writer discovered some very good gold-bearing gravels in Alaska, but he was unable to mine. There is something besides the presence of valuable minerals and the ability to win them from their natural matrices that is essential to a mine. It is here, in our considerations of the mining industry, that we come into real economic notions for the first time. Yes, according to the latest ideas, we are wrong in stating that any worked or workable mineral deposit is a mine, if it does not contain possibilities of profitable working. This is now the prime thought of every up-to-date mining manager or engineer. It is this notion that will distinguish a mine from a prospect. The prospect may become a mine by proving itself profitably workable: if it simply carries values which cannot be realized to advantage, then it must continue as a mere prospect. There are cases of properties which possess rich deposits and which are loosely called mines. These properties may be observed to be erratic in their productiveness, owing to the very pockety nature of the deposits; and the owners, although they do, indeed, strike occasional handsome bonanzas, expend all the profits of such finds—or even greater amounts—in searching for other pockets. Is such work profitable? Is it mining? The trouble with the cited placers of South America is that climatic, hygienic and political conditions have been antagonistic to successful working: the ground is rich, but it cannot be handled to make money. In the case of the Alaska gravels, there was no available, though essential, water supply. The Kentucky galena cannot be economically separated from the containing heavy spar. 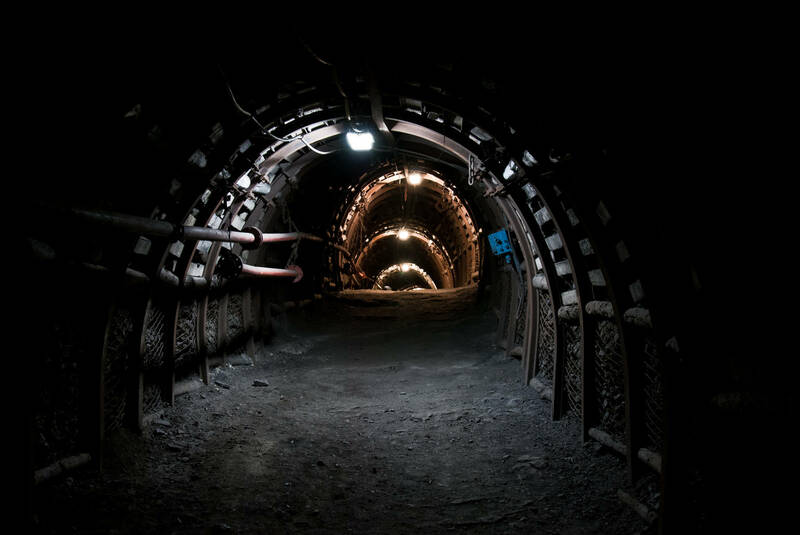 Coal, which is sold at comparatively low figures per ton, must be handled at the mines in large quantities to pay, so that a thin seam or a scattered deposit is not suitable for mining. Under these restrictions of our new definitions, we run across many interesting points. For instance, one may ask the question about the old abandoned hole in the ground which is occasionally found by prospectors, "Is it a mine?" The answer can be simply another query as to whether the hole was abandoned because it contained no value, or because, containing value, it could not be profitably worked. As we think of mines nowadays, we can conceive several reasons why, before the advent of transportation lines and the invention of modern metallurgical processes and many forms of labor-saving machinery now so common in and about mines, many very rich deposits may have been necessarily forsaken by their discoverers. But such a property would, if now worked, probably prove highly profitable. We thus note that there exists some elasticity in the meaning of the word mine. An unprofitable project at one time may develop into a mine at a later period. Many gold mines have become worthless propositions merely through changes in the ore that have rendered further work unremunerative.